At 27, he was a little older than most, having left a career as something of a rising star in the banking world to enlist. Like most, he was unmarried, listing his two younger sisters Ada and Bessie as his next of kin and the family home on Dewson Street in the city’s west end as his address. The only distinguishing mark noted on his attestation papers was a mole on the left side of his neck. There was certainly nothing about him, or in his subsequent service record, that could have predicted what he would do on a warm autumn day in northern France, in a small town on the outskirts of the city of Cambrai. On the afternoon of October 11, 1918, in the town of Iwuy, a few kilometres northwest of Cambrai, Lieut. Wallace Lloyd Algie launched the most successful section attack in Canadian Army history, leading a force of only nine soldiers to clear the entire town of its German defenders. His actions lifted German machinegun fire that had pinned down the entire battalion, and undoubtedly saved many of his comrades lives. It certainly allowed the 20th Battalion to push forward and crack the last line in the German defences. His commanding officer, Lt.-Col. B.O. Hooper, called it “the nerviest thing I have ever seen” and recommended Algie for the Victoria Cross. Sadly, it was posthumous. Algie was killed shortly after his audacious attack, while racing back with reinforcements to help his badly outnumbered men to hold the town they had captured. Algie had signed up two years after the war began, giving up a promising career in banking. He had been named acting manager of the Toronto Bank (later TD Bank) branch on Elm Street – unusual in 1916 for someone so relatively young. He was the son of a prosperous doctor, born and raised in Alton, Ont. (just south of Orangeville). The Algie family moved to Toronto around the turn of the century, when Dr. James Algie was appointed to the staff of the Toronto Hospital for the Criminally Insane. Algie had an interest in the military even before the war. Once a week, he had played with the 48th Highlanders pipe and drum corps and it was natural for him to join the flood of young Canadians who enlisted, enlisting as a private in the Queen’s Own Rifles. Six months later, he volunteered for overseas duty and was commissioned as a lieutenant in the 20th Battalion. He spent much of his first year with the Battalion in training, in keeping with the CEF’s hard-learned lessons of the first years of the war: junior officers fresh off the boat from Canada were of little use (and arguably caused more harm than good) without training in the profession of arms. Algie took courses in bombing (grenades in the British Army at the time were known as Mills Bombs), learning the basics of trench warfare and raiding, before finishing another course in machine gunnery, at the Canadian Corps school in Aldershot, England. He didn’t arrive at the battalion until May of 1917, just after the battle of Vimy Ridge. He was posted to the Battalion headquarters – not an uncommon first assignment for new officers – and put in charge of the Lewis gun (machinegun) platoon. Just two months before he was killed, Algie was granted 14 days leave. He spent it, according to a report published after his death in the Toronto Daily Star, visiting the ancestral home of the Algie clan in Perthshire, Scotland. When he returned to the front preparations were well underway for yet another attack, the Battle of Canal du Nord and a resumption of the relentless offensives that had driven the Germans back from lines they had held since the beginning of the war. 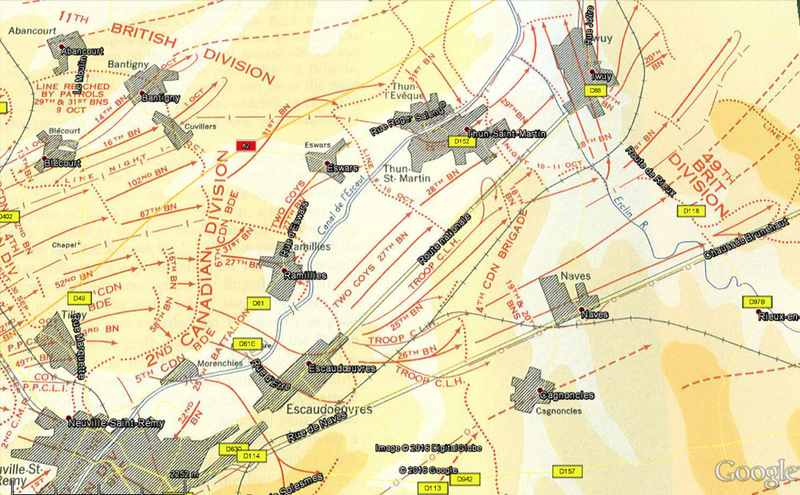 The Canadian assault on Canal du Nord was a masterpiece of planning and coordination, regarded by many historians as Lt.-Gen. Sir Arthur Currie’s greatest achievement. It relied on precise timing, complex manoeuvres, and was made possible by the professionalism and aggressiveness of the officers and men of the Canadian Corps. The 20th was held in reserve for this battle, which began on 27 September, 1918, but once the formidable obstacles of the canals and the German defences built behind them were breached, the Battalion was in the forefront of the Canadian efforts to exploit Currie’s victory. The prize was the city of Cambrai, 15 kilometres behind the German lines breached at Canal du Nord, a vital railway junction and key supply node for the entire northern half of the German front lines. But the weeks of almost constant fighting had taken their toll on the 20th Battalion. The fighting to breach the German’s Hindenburg Line had bled the unit of nearly 600 soldiers, at one point in mid-September leaving it with only eight officers and 120 other ranks. Thus, when Algie returned to the Battalion he was put in charge of B Company, although still a lieutenant, for the Canadian Corps’ charge on Cambrai. The Germans, still reeling from their losses at Canal du Nord, were unprepared for an attack coming so soon after their well-defended lines at Canal du Nord had been shattered and quickly gave way. The city of Cambrai fell to the Canadians almost without a fight on 8 October, but German resistance stiffened outside the city and the offensive slowed as casualties mounted. The 20th was in the lead for the push past Cambrai, forming the tip of the spear for the 4th Canadian Infantry Brigade as it swept north and west of the newly captured city on the extreme left of the very narrow Canadian Corps front. The countryside around Cambrai is open farmland, dotted by towns and small villages and bisected by deep canals, sunken roads and railroad tracks on elevated embankments, creating natural defensive terrain with formidable obstacles, and (literally) canalizing ground that forced attackers into open fields of fire. The Germans took full advantage of these conditions and the Canadian advance began to slow. Algie’s B Company was in the lead as the 20th Battalion approached the town of Iwuy, about 10 kilometres northwest of Cambrai, advancing through fields of wheat and barley under sporadic artillery and machinegun fire from the retreating Germans. Lt.-Col. Hooper observed later that Algie was “the man in front” of the entire Battalion, indeed the whole Canadian 2nd Division. The Battalion’s advance had been so rapid that it had outpaced its artillery support and they began taking heavy machinegun fire from a high railway embankment that paralleled their route into Iwuy and from the outskirts of the town itself. When Algie came close enough to get a good view of the town, he was alarmed at what he saw. The Germans had fortified themselves behind a solid barricade of lumber and barbed wire at the entrances to the village, converting the stone houses into strong points. They were also laying down a relentless rain of steady fire that was causing heavy casualties to the 20th Battalion. Worse still, he could see the enemy bringing up extra machineguns that, once in position, would pose a serious threat to the Canadians and to the British 11th Division on their left. Algie called for volunteers from his already much-dimished company, and led the nine soldiers who stepped forward at a run along the left flank, skirting the battalion’s boundary with the British division to their north. His small force entered the town from the northwest and hit the Germans from the rear. They surprised and killed two machinegun crews, one of them taken by Algie himself, armed only with his revolver. The Canadians turned the captured guns as well as their own Lewis gun on the rest of the town’s German defenders, using the tombstones in the village cemetery as cover. The speed and daring of Algie’s attack overwhelmed the Germans, and his small force quickly captured the officer in charge of the town’s defence and cleared the east end of Iwuy, a move that made it possible for the 20th Battalion to take the rest of the village. But Algie never saw the results of his bold attack. When the east end of the town was clear, he went back to the battalion for reinforcements. While he was leading them into the town, a German holdout who had been hiding in one of the houses opened up on him at point blank range, killing him instantly. Iwuy was a part of the very last of the multiple belts of trenches and fortifications that made up the Hindenburg Line. Beyond it, the Germans did not have a coherent defence line and after it fell they were in full retreat. But the cost was high. At the end of the day at Iwuy, the 20th Battalion could muster only 300 soldiers of all ranks: from Commanding Officer to cooks. Over 1,100 men had been killed or wounded since the start of Canada's "Hundred Days" at Amiens on 8 August, and there was still work to do. Algie was hastily buried and the next day the 20th Battaliom resumed their advance. 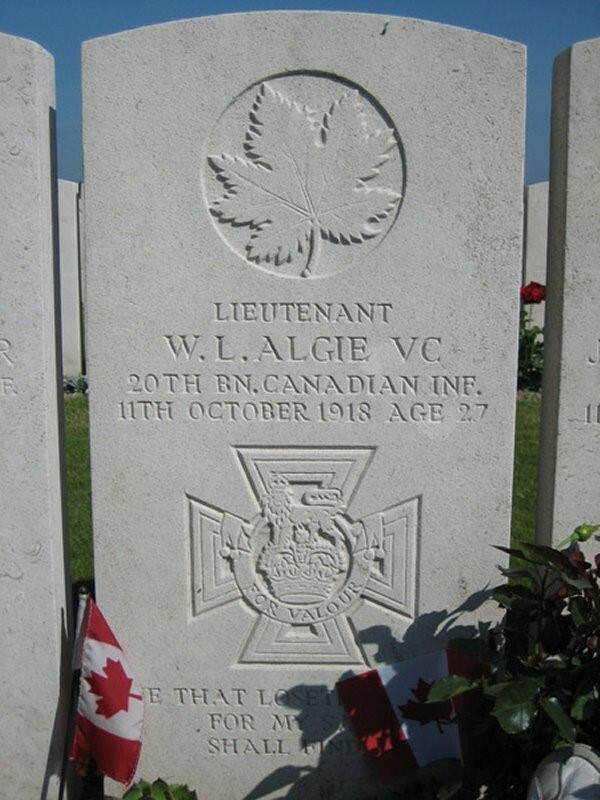 Algie’s final resting place is the Niagara Cemetery, a small and lonely Commonwealth War Graves cemetery just outside Iwuy, within sight of the town where he fought his last battle.